The Finish Thompson MSE Drum Pump. Drum or barrel emptying pumps are known to be the most reliable and efficient device for transferring acids, corrosives and chemicals from container-to-container, and a much more practical alternative to hand pumps. The PF Series is manufactured by Finish Thompson and available from Michael Smith Engineers. 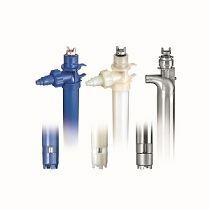 These sealless drum pumps are now offered with a choice of six tube lengths. The new tube length is 137 cm (54 in) which is ideal for 1040 litre (330 gallon) IBC’s (Intermediate Bulk Container), also known as totes. It is a better alternative to the existing PF 152 cm (60 in) tube when used for transferring liquids from IBCs. This new tube length option is available on the two polypropylene designs, the PFM and PFP, the PVDF model PFV and also the stainless steel PFS model. The other key features of PF Series drum pumps include; a sealless design which improves reliability, a double suction impeller which provides a high flow and high head capability (flows up to 151 litres per min, heads up to 24 m) and easy disassembly for cleaning.